Lead is a soft and malleable metal with a relatively low melting point. These properties make it easy to work and cast, and in combination with the relative ease of extracting lead metal from its ore, are responsible for its early use by human societies. The earliest lead artifacts, found in modern-day Turkey, date back to 6400 BCE. Lead was used most extensively in antiquity by Roman society, who produced the metal on an industrial scale as a byproduct of silver smelting and used it in the production of pipes to carry water. The metal was known to the Romans by the latin plumbum, from which both the element’s symbol on the periodic table and the english word “plumbing” are derived. The english “lead” is known to have Anglo Saxon roots, but there are conflicting accounts of its precise etymology. Even ancient civilizations had some awareness of the toxicity of lead, as several Greek and Roman scholars noted stomach pains, paralysis, and other ailments in workers who dealt frequently with the metal. Despite this, lead was used in pipes, dishes, cosmetics, coins, and paints, and even intentionally added to foods in the form of lead acetate. Over time, further evidence of the element’s toxicity accumulated, but the severity of the risk still failed to be fully appreciated or adequately mitigated. After the fall of Roman civilization, lead continued to be used in pipes and artist pigments, and lead oxide was used to make leaded glass or lead crystal. Lead glass containers were often used to store alcoholic beverages for long periods, allowing lead to leach into the liquid. Lead was also a major component of type metal, the alloy used to produce the moveable type used in printing presses. Lead compounds ubiquitous well into the twentieth century: lead pigments were commonly found in artists paints and house paint, tetraethyllead was used as an antiknock agent in automotive fuel, and lead solder was used to seal joints between pieces of pipe used to carry drinking water until new regulations were effected starting in the 1970s. The effects of these applications linger even today--leaded fuel is still sold in developing nations and for some types of aircraft, and lead in plumbing and paint in older buildings is still often causes neurotoxicity in children, who are particularly susceptible to lead's health effects. Today, lead continues to be used, though primarily in applications where the health and environmental risks are low, or where no suitable alternatives have yet been presented. More than half of all lead produced annually is used in lead-acid car batteries. Though using such toxic batteries is not ideal, alternatives are being researched and the majority of lead-acid batteries are recycled, keeping the majority of their lead content out of the waste stream. Lead is often used to line walls or storage containers to provide radiation shielding, and in weights used in sports equipment and applications such as scuba diving and boat ballast, all applications that present relatively low environmental risk. Lead oxide is still used to produce high-refractive index glass and to produce glass solder. These glasses are mostly used for optical applications or in electronics, and therefore the concern of lead leaching into liquids meant for consumption is not significant. Finally, lead-containing soft solder is being phased out of use in electronics due to concerns about leaching following the disposal of the devices. One final use of lead is in semiconductor devices. There are four binary lead semiconductors: lead iodide, lead sulfide, lead selenide, and lead telluride. Each of these is used in producing radiation detectors--lead iodide in detectors of high-energy radiation such as x-rays or gamma rays, and the remaining three in infrared detectors. Additionally, nanocrystals or “quantum dots” of these compounds, in addition to ternary lead semiconductors, are areas of active research. There is potential for lead-containing quantum dots to be used in solar cells or advanced display screens in the future. The most commonly exploited lead mineral is galena, a naturally occurring form of lead sulfide. Lead ores are roasted to produce lead oxides, which are then reduced to metallic lead. Only about half of lead used annually comes from newly mined ores; the rest is acquired through recycling. Large quantities of lead, both the dioxide and the metal, are used in batteries, cable covering, plumbing, and ammunition. Lead is highly resistant to corrosion and can be used to contain corrosive liquids such as sulphuric acid. Lead is also extremely effective at absorbing sound and vibration. It is used as radiation shielding for X-ray equipment and nuclear reactors. Lead alloys include solder, type metal, and various anti-friction metals and compounds. Lead oxides are used in producing fine "crystal glass" and "flint glass" of a high index of refraction for achromatic lenses. Lead ceramics and crystalline material have a wide range of industrial and optical applications, including infrared detection and imaging. Lead-based semiconductors, such as lead telluride, lead selenide and lead antimonide are finding application in photovoltaic (solar energy) cells and infrared detectors. White lead, the b asic carbonate, sublimed white lead, chrome yellow, and other lead compounds are used in paints- although the use of lead in paints has been drastically curtailed in recent years to reduce health hazards. Lead is available as metal and compounds with purities from 99% to 99.9999% (ACS grade to ultra-high purity). Lead oxides are available in forms including powders and dense pellets for such uses as optical coating and thin film applications.Oxides tend to be insoluble. Lead fluorides are another insoluble form for uses in which oxygen is undesirable such as metallurgy, chemical and physical vapor deposition and in some optical coatings. Lead is also available in soluble forms including chlorides, nitrates and acetates. These compounds are manufactured as solutions at specified stoichiometries. Lead is a Block P, Group 14, Period 6 element. The number of electrons in each of Lead's shells is 2, 8, 18, 32, 18, 4 and its electron configuration is [Xe] 4f14 5d10 6s2 6p2. The lead atom has a radius of 175.pm and its Van der Waals radius is 202.pm. In its elemental form, CAS 7439-92-1, lead has a metallic gray appearance. Lead occurs naturally as a mixture of four stable isotopes: 204Pb (1.48%), 206Pb (23.6%), 207Pb (22.6%), and 208Pb (52.3%). Lead is obtained mainly from galena (PbS) by a roasting process. Anglesite, cerussite, and minim are other common lead minerals. Lead has been used by human civilizations for all of recorded history. Lead information, including technical data, safety data, high purity properties, research, applications and other useful facts are discussed below. Scientific facts such as the atomic structure, ionization energy, abundance on earth, conductivity and thermal properties are also included. Safety data for Lead metal forms, lead nanoparticles and lead compounds. For potential hazard information, toxicity, and road, sea and air transportation limitations, such as DOT Hazard Class, DOT Number, EU Number, NFPA Health rating and RTECS Class, please see the specific lead material or compound referenced in the Products tab. The below information applies to elemental (metallic) Lead. H373 May cause damage to the reproductive system, the blood, the brain and the endocrine system through prolonged or repeated exposure. Route ofexposure: Oral, Inhalative. 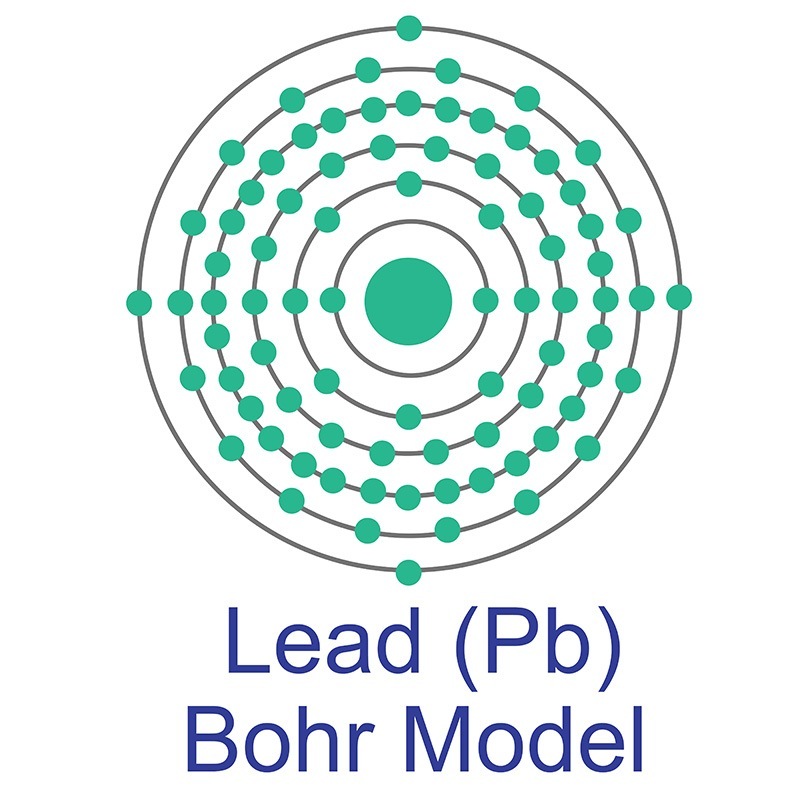 Lead (Pb) has four stable isotopes. Lead-204 is a primordial nuclide. Lead-206, Lead-207, and Lead-208 result from the uranium (or radium) series, the actinium series, and the thorium series decay chains respectively.